This, ladies and gents, is the VW Golf GTI Clubsport S. And it holds two pretty key records: it’s the most powerful production Golf ever, and it’s the fastest front-drive car to lap the Nürburgring. The key numbers are 306bhp and 7:49.21. 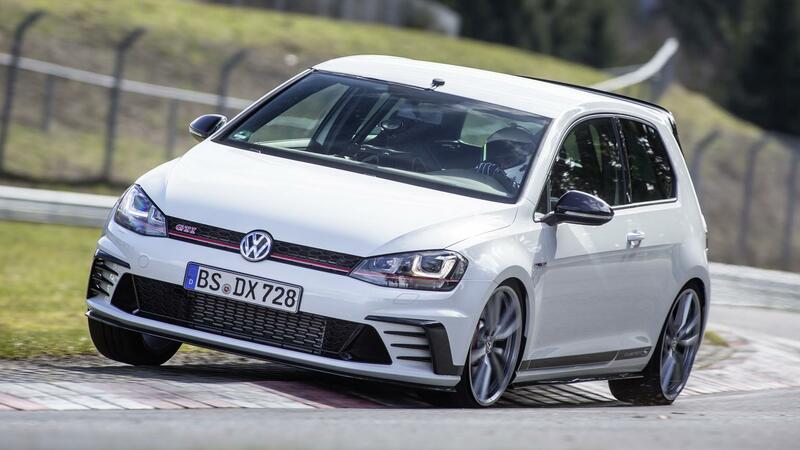 The former its new power output, up from the regular GTI Clubsport’s 261bhp and 10bhp healthier than the four-wheel-drive Golf R. The latter is its Nordschleife lap time, set by German racer Benny Leuchter, and over a second quicker than the Honda Civic Type-R.
Changes over the regular GTI are numerous. There’s the additional power from its 2.0-litre turbo four-cylinder, for starters, and a new exhaust system. But perhaps more notable is the complete ditching of the rear seats, VW seemingly taking a leaf out of Renault’s Ring-bashing book. Joining the rear bench in the skip is the parcel shelf, arm rests and some of the noise insulation, while there’s a smaller battery installed, too. The result is a 1,360kg kerb weight, which alongside the extra power, yields a 0-100kmh time of 5.8secs, and a top speed of 266kmh. Yep, VW has also binned the electronic limiter. It’s tuned the suspension too, with outright stability – and the eradication of any pesky understeer or oversteer moments – the target. The stability control can be turned completely off, though. What interests us most, though, is the addition of a ‘Nürburgring mode’ among the Golf’s familiar Driver Profile selections. Contrary to expectation, pressing it doesn’t lead to a sudden increase in driver cockiness and a dashcam that automatically uploads your embarrassing crash footage to YouTube. Instead, it sets the suspension’s Dynamic Chassis Control into an appropriate mode, the one perfectly tuned to enable you to aim for a 7:49 of your own. And if you think that means you’ll shatter to pieces as soon as you encounter a pothole, then VW is ready to counter your worries. “If a car is fine-tuned for driving on normal racetracks, then the chassis is normally made pretty hard, but this isn’t helpful on the Nordschleife,” we’re told. The GTI Clubsport S marks the 40th anniversary of the VW Golf GTI, and it’s going to be unveiled at the Wörthersee GTI festival. It will come in three colours – red, white and black – but only ever as a three-door manual, which is good news. Equally good news is the fact that out of the 400 being built, we in the UK will get 150, even more than homeland Germany. Expect a feisty queue and a circa-£35k price tag if you’re interested.